This past week I was away from home, but still made sure to take my colored pencils, watercolor paints and paper with me. In my free time, I wanted to challenge myself to design around gemstones that are visually more unusual. I chose to focus on an opal for my first project. Opals, commonly considered October’s birthstone in the US, have long been regarded in many cultures as having supernatural origins and powers. The ancient Greeks believed that opals endowed the wearer with the gift of prophecy and guarded them from sickness; Europeans have long considered the gem a symbol of hope, purity and truth. 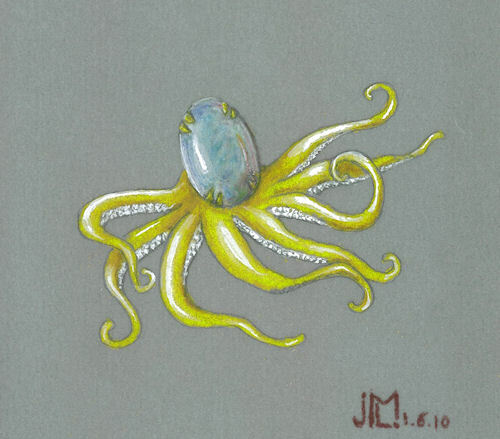 I chose to create an octopus brooch since the translucent play-of-color in the opal suggested the mysterious depths of the ocean to me. The tentacles in this yellow gold brooch have round brilliant diamond “suction cups” – a most classy octopus!